It's been a very nice Christmas break here for us...so nice that I think we are all dreading the day when school starts back up later this week because that means we will all be going our separate ways again. Zoey got some fun doll items for Christmas and before things get crazy again I wanted to be sure to try and share some of them here with you. Her dad and I got her the doll Ivy (Amanda picked it up for us at the American Girl Museum Benefit sale for $30) and she also got Ivy's accessories and her cute play romper outfit. Santa surprised us with McKenna's bar and beam set along with her trophies and ribbons! Zoey was so excited about this since it's not available for purchase anymore...Santa does a pretty good job! Ivy is so sweet! We love her to pieces already and Julie is so happy to have her best friend here now. Ivy is enjoying using the gymnastics set too...so fun! In addition to McKenna's bar and beam set and the trophies, Zoey also got McKenna's retired warm-up outfit! I was so excited about this (Zoey was too), it's such a cute outfit and really rounds out the collection we have for her now. You might have noticed, but we altered the salon backdrop a wee bit to create a gymnastics studio backdrop instead. It's a nice little play area for right now. which also came with this adorable hat! Ivy came with these pj's and slippers too which was nice. Don't you think they look so nice on her? So comfy looking! Claire got this fresh new outfit this year...she loves it and we think the colors and style fit her to a T! So cute and casual. And then Elizabeth got this cozy sweater set. It will be perfect for when she has to bundle up and walk Pepper this winter. It's a cute set but I will say that I've already had to try and fix several sweater pulls already (that velcro is not very friendly to knit items!). I do love the stretchy boots though! So cute! Zoey got a gift from Santa and the Merfolk this year...it included a really neat book about the history of mermaids and then a mermaid tail/outfit for her AND for her dolls! Here is the one for the dolls...so cool! There are a few more doll items that we have left to share with you but they will come in another post because they are somewhat related. We hope you enjoyed your Christmas holiday and that it was somewhat "Dolly"! I got Marie-Grace and some other AG things! Is Zoey a gymnast? She isn't in gymnastics but she is a dancer!! Marie-Grace is so sweet looking, how fun! Hi! 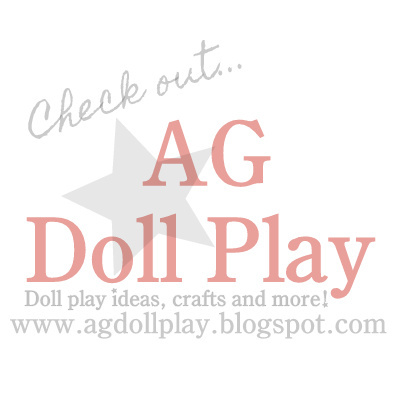 I was wondering if you could do a doll room tour! I love how you set it up and am looking for ideas! Perhaps we can work on that this weekend! It would be fun and it's been awhile since we've done that...it's switched up quite a bit from what it was originally. :) Thanks for the suggestion!